I've never tried any MUA make up before, and was so excited when my lovely boyfriend said he'd treat me to some. I had so much to choose from. Gorgeous palettes, primers of all kinds, a bunch of beautiful lipstick - I could've spent a lot! This is what I eventually chose. However one of these lipsticks shown is from a blog swap I got involved in where you can see here. So here's what I got. I had to get my hands on a few palettes as I've heard so much about them. On the top left we have Heaven and Earth, 12 shimmery beiges, browns, creams and golds - Perfect for everyday looks. Below that we have Poptastic, full of bright party colours. 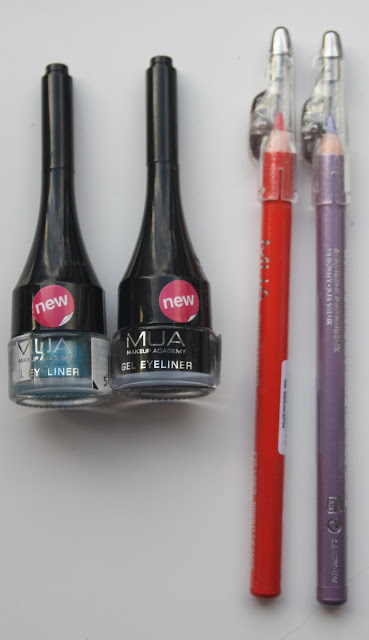 I felt most of these shades were very shimmery, with 2 or 3 colours that had a more matte look. On the right we have Glitter Ball, my favourite. This baby is packed full of glitter. Perfect for any night time club look. I will be swatching these all for you this week so you can have a more detailed look on these beautiful shades! Now we have the face products. I picked up the Eye Primer because now being a student I can't buy the amazing Primer Potion by Urban Decay anymore! So I chose this to see if it lived up to its 'Long Lasting and No Crease' formula it claims to have. I don't wear foundation so I thought the BB cream would be right up my street. Because I'm so pale I wasn't sure if this would match, but it worked a treat. I also treated myself to the Mosaic Blush in English Rose which is full of lilacs, rose and sand colours. I can't wait to show you swatches and a more in depth description soon! I love my eyeliners, and I wanted to try MUA's gel ones as I've never tried a gel before. I grabbed Tribe, a gorgeous bright metallic blue which I am so excited to use! I love using bright eyeliners under my eyes sometimes for an edgy look. I also picked up the classic black named Underground. I also chose Bright Orange intense colour eyeliner as I love orange!! Thought this would be perfect for fancy dress, and this is exclusive to online purchases, so I thought I may as well! Because spring is around the corner I picked up Lovely Lilac, a metallic soft purple which I can't wait to wear and show you. If you're a regular here (If you are, then thank you so much and please let me know!) then you will know that I love my nail art and I've tried a bead nail effect before here by Accessorize. 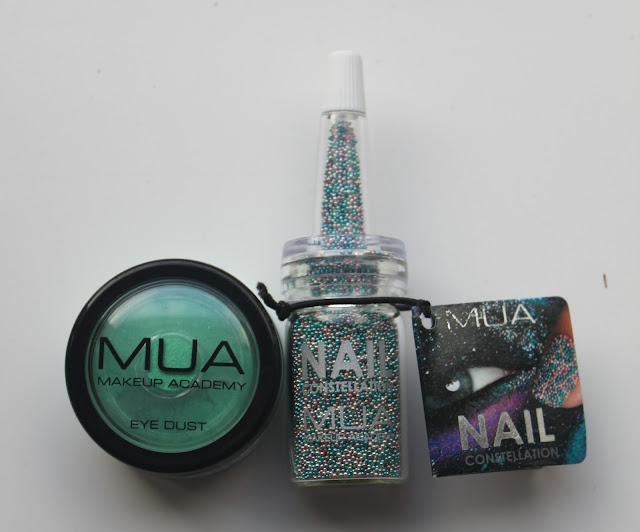 I'm really excited to show you the MUA Nail Constellation in more detail soon as the shade Pisces is gorgeous! I also picked up the Eye Dust in shade 3 that I will show you all soon! 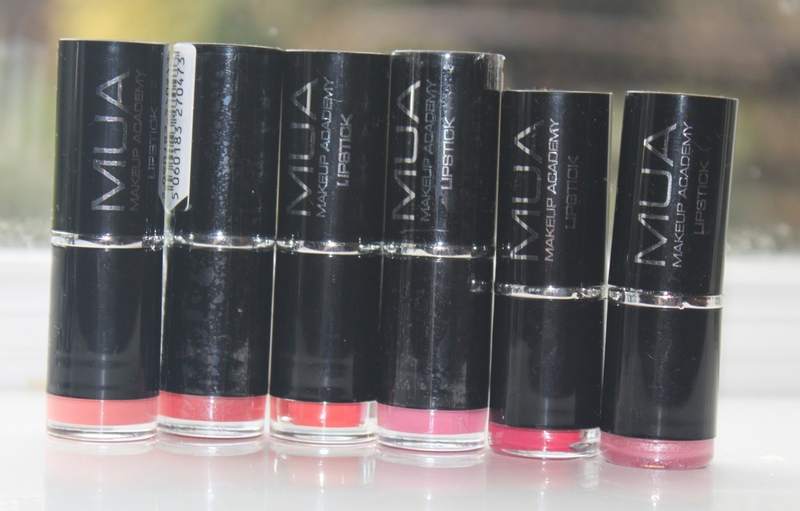 Lastly we have lipsticks! You know I love my lipsticks! In order we have shade 7, Juicy shade 15, Nectar shade 16, shade 4, shade 3 and shade 5 which I got in my blog swap. Now I'm very puzzled. Some have names and some don't - and I like my products to be named and not numbered. A name gives the shade more personality. Also, two of my lipsticks on the right side are obviously shorter - So again, I am puzzled as to why. I will be showing you how these all look very soon and I can't wait for you to see them. Overall I got some gems thanks to my lovely boyfriend. I can't wait to swatch these all and show you how they look worn in the very near future. What are your favourite MUA products? Do you have any of these? What are your MUA hit and misses? I've recently purchased few things from MUA. Really rate them. The eye primer is really good. I've just got the Pro Brow eyebrow kit. It's awesome. Just did a review today. Check it out. love it! 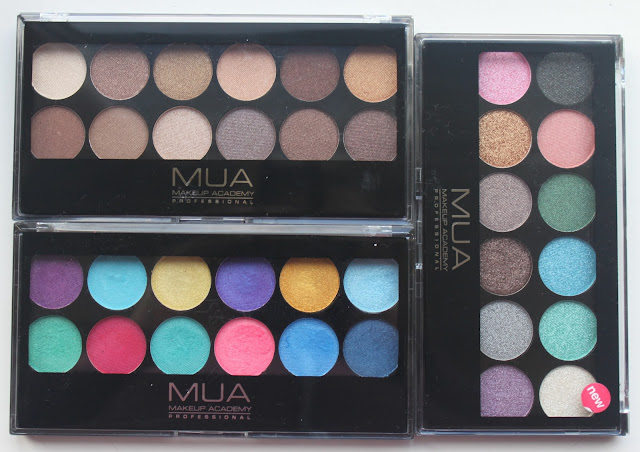 i recently bought the mua palette in undressed and it is really nice! The nail constellation seems super col, and is probably way cheaper then ciate! Wow, you have a good boyfriend! Mine bought me an MUA nail varnish the other day and thought he'd done well, I will be having words! I've got Shade 4 too, I found it wasn't very pigmented, but the eye palettes are really good. Heaven and Earth is my fave. The nail constellation looks lovely, looking forward to seeing what it looks like! It looks like you got some good stuff there though! Wow you got a lot of stuff - I love MUA! 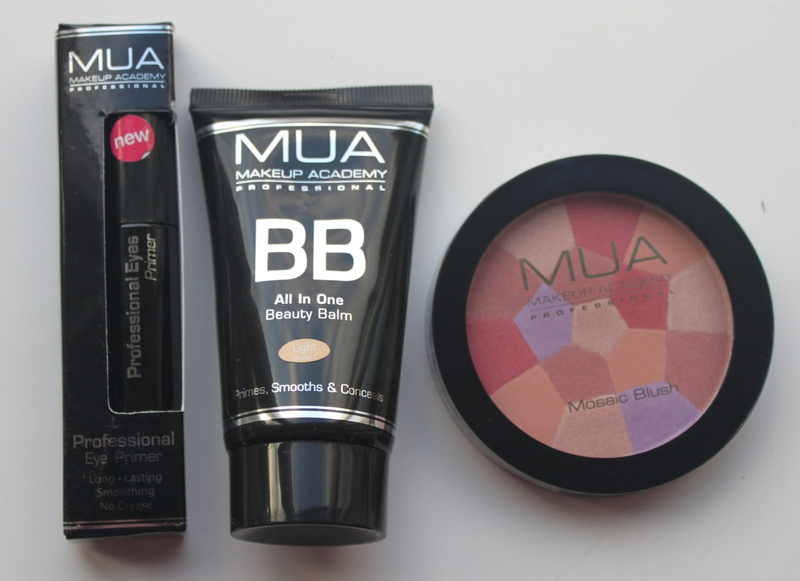 What a lovely selection you have from MUA , i have the eye primer, mascara and heaven and earth palette and love them all so much. Amazing quality for the prices :) looking forward to some reviews on products youve got that i havent!! Those palettes look fabulous! I must must must try! what a haul!love this brand, there's some gems in their collection! Wowww such a great haul. Bought Poptastic and Glitter Ball based on your raves. Can't wait for them to get here so I can swatch them! I've also ordered the Eye Primer, though I might regret it. On the other hand, my Benefit Stray Don't Stay has been MIA for almost a year now and I need an eye primer!